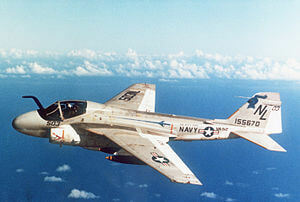 Developed from the smaller Northrop YF-17 aircraft, the unsuccessful competitor to the F-16 in the USAF lightweight fighter contest, the A/F-18 first flew in 1978. 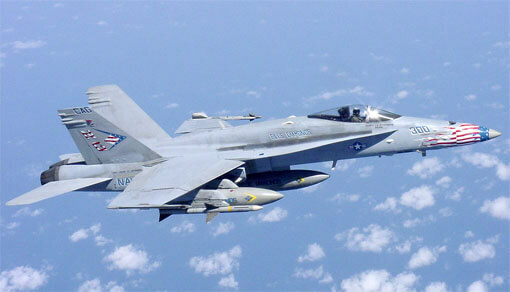 The standard US Navy versions were the F-18A thru F-18D with increasing capabilities. 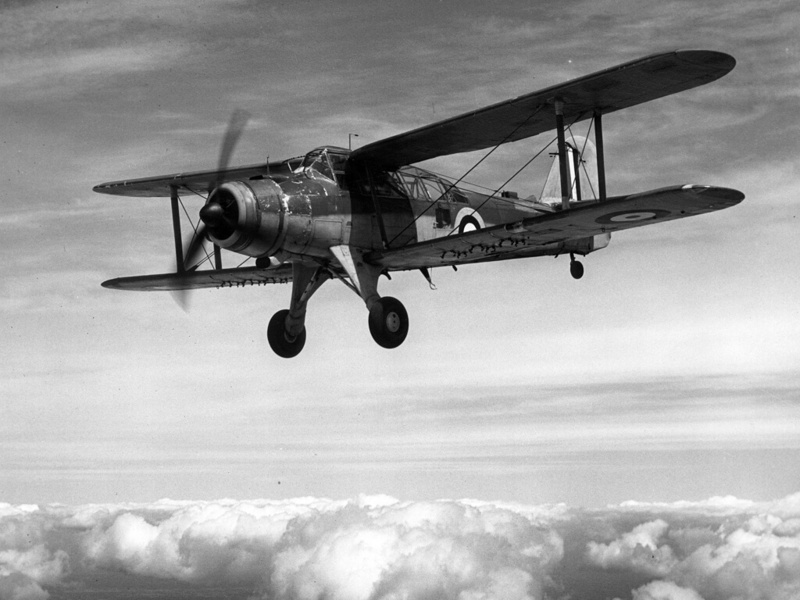 The aircraft has participated in a number of combat situations including Libya, the 1990 Gulf War and the 2003 Iraq War. The aircraft has been exported to a number of countries including Australia, Canada, Switzerland, Malaysia, Spain and Kuwait. This title contains the electronic flight manuals and checklists for the McDonnell-Douglas F/A-18A/B/C/D Hornet. 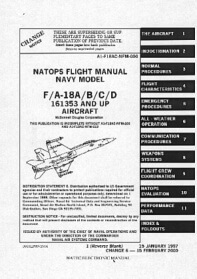 A/F-18A/B/C/D NATOPS Flight Manual, NFM A1-F18AC-NFM-000 dated 15-9-08 with approx 899 pages. 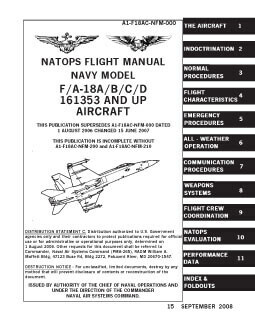 A/F-18A/B/C/D NATOPS Flight Manual, NFM A1-F18AC-NFM-000 dated 15-1-97 revised to 15-2-00 with approx 733 pages. 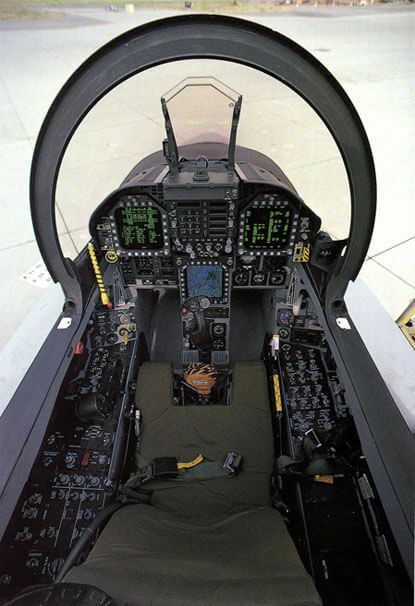 A/F-18A/B/C/D Pilot’s Checklist, NFM A1-F18AC-NFM-500 dated 1-9-99 revised to 15-2-00 with approx 214 pages. A/F-18A/B/C/D Functional Checkflight Checklist, NFM A1-F18AC-NFM-700 dated 15-2-00, with approx 42 pages. 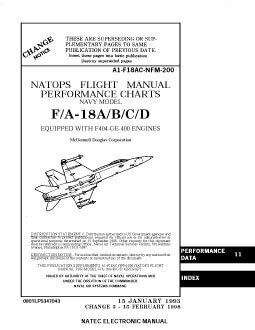 A/F-18A/B/C/D Flight Manual Performance Charts, NFM A1-F18AC-NFM-200 dated 15-1-93 revised to 15-2-98, with approx 324 pages. 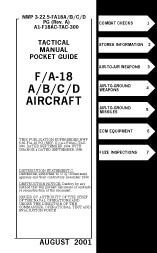 A/F-18A/B/C/D Tactical Manual Pocket Guide, A1-F18AC-TAC-300 dated August 2001 with approx 151 pages.